Numbers and statistical claims dominate today's news. Politics, budgets, crime analysis, medical issues, and sports reporting all demand numbers. 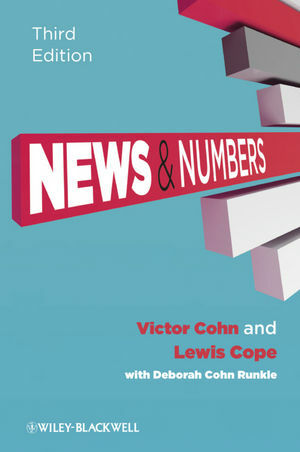 Now in its third edition, News & Numbers focuses on how to evaluate statistical claims in science, health, medicine, and politics. It does so by helping readers answer three key questions about all scientific studies, polls, and other statistical claims: "What can I believe?" "What does it mean?" and "How can I explain it to others?" The late Victor Cohn, called the “Dean of Science Writers” was the prize-winning science editor and writer for The Washington Post for 25 years. He was cited as one of the top science writers by The New York Times and Newsweek, co-founded the Council for the Advancement of Science Writing and served as president of the National Association of Science Writers. Lewis Cope was science writer at the Star Tribune of Minneapolis-St. Paul for 29 years and, like Cohn, the recipient of numerous awards. Cope formerly served as president of the National Association of Science Writers. Deborah Cohn Runkle is a Senior Program Associate at the American Association for the Advancement of Science.